A sight of great beauty, standing with impassive dignity, a Collie is a friendly and elegant dog. Here’s more on this wonderful breed. Here is the breed who is extremely elegant and glamorous when in full coat. Their head is in proportion to the size of the dog. Whatever the colour of the dog, the nose is black. The neck is muscular, powerful, of fair length and well arched. The shoulder is sloped and well angulated. The forelegs are straight and muscular, neither in nor out at elbows, with a moderate amount of bone. The hind legs are muscular at the thighs, clean and sinewy below, with well bent stifles. Hocks are well let down and powerful. They are available in three colours: sable and white, tri-colour and blue merle. Queen Victoria had several rough Collies working on her estate at Balmoral in Scotland and it was largely through her patronage that did much to popularise the breed. 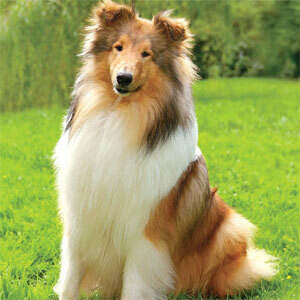 The traditionally bred rough Collie of today is probably the most likely to resemble his sheep herding ancestors. Their construction is very similar – masculine and athletic in appearance, built on lines of strength activity and grace with a shapely body and sound legs and feet. However, a very large percentage of the Collies in Britain today differ from the traditional Collie. The breeders have put great emphasis on prettiness and beauty. There are exceptions to the rule but in the main they are smaller than the traditional Collie. Many purists believe that this has taken away much from the breed and the Collie’s natural bent for sheepdog work and have now started importing Collies particularly from North America and Europe to maintain their type and size. The Collies have a friendly disposition with no trace of nervousness or aggressiveness. They are friendly and intelligent. Collies are an ideal family and good guard dogs. They can be vocal if faced with strangers or anything they have not seen before. They are fine with children provided the pet parents are responsible owners and don’t let their children be too overpowering with them. “It’s always better to bring home a puppy rather than an older dog who may not be used to children,” advises David. Collies need regular exercise; the best exercise for a Collie is free running and playing in fields. “I myself walk my Collies between three and four miles daily; this is because I have the freedom of the Cotswolds but it is not necessary to walk them that far,” says David. After Collie puppies are weaned from their mothers, they should be house trained, followed by lead training and gradually getting them socialised. Getting them used to going out in a car is always a good idea as it may stop car sickness as they grow older. Socialising with people and going to dog classes can only do good and be confidence building for them. It is always a good idea to get them used to be groomed from an early age with a variety of brushes and combs available. “When Collies shed their coat usually for the first time at about 12 months of age, it usually comes out in handfuls and the quicker the dead hair is removed, the sooner the new coat will come through,” tells David. Collies like playing with a ball. They can be seen carrying sticks and where there are two Collies, they like to play hide and seek in the garden. “When out on walks, they like chasing birds that may settle on the grass fairly close to them,” adds David. Collie Eye Anomaly (CEA) is widespread in the breed. “The only age at which CEA can be accurately and permanently diagnosed is at six to seven weeks. A puppy who is clear then is known to be clear for life and will be highly valued as a breeding proposition,” concludes David. David Abbott imported Sky from Europe during 2012 to strengthen his breeding team and has had a very successful puppy career since arriving in England with eight wins at Championship Shows and three wins at Open Shows. Born on 4th October 2000 with two siblings, Shady was clearly bound for stardom and is surely ‘the dog of a lifetime.’ Slightly smaller but no less robust than her sisters Lacey and Blondie, she pushed her way through and was soon heading the pack. Always full of self importance, she had a way of ‘drawing’ the eye with her fabulous glamour, free movement and showmanship. Her show career was consistent from the time she started as a minor puppy, going on to win the prestigious ‘NI Pup of the Year’ at the end of 2001, with her first CC coming at the age of 13 months, till she retired in 2007, having won a total of 23 Challenge Certificates, 20 Best of Breed, 7 Championship Best in Show, 3 Res. Best in Show, 4 x Group 1 and numerous group placings. She was the first female dog of the breed to win Best in Show at a General All Breed Championship Show, holds the female dog CC breed record and was the UK Top Winning Collie (Rough) for three consecutive years – 2003, 2004 and 2005 with another highlight in 2005 when she won Best of Breed at Crufts and placed Group 3. She was fearlessly campaigned and won equally well under Breed Specialist and All Round judges alike. Shady is the dam of several Champion/International Champion offspring and is now into her 13th year, she is quite well and active with excellent sight and hearing, though not without her old bones showing a little discomfort some days. We hope she remains well enough to enjoy another summer, watching and barking at her sons, daughters and grand children enjoying crazy chases in the paddock. –Valerie and John Geddes, Ingledene Collies. http://www.dogsandpupsmagazine.com/wp-content/uploads/2013/08/Solomon-f.jpg 133 250 Dogs and pups Magazine http://www.dogsandpupsmagazine.com/wp-content/uploads/2017/05/1254nal.jpg Dogs and pups Magazine2013-03-23 14:10:142014-02-07 17:40:31Charming Collies! 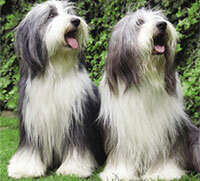 Bearded Collies: fun-loving beautiful chaps! A Beardie is a winsome, funny, loving, sometimes silly, sometimes pouty, adorable, curious, persistent creature, in short, close to humans. Just be prepared to brush long hair, wet beards in your lap, and muddy pawprints in the wrong places at the wrong time…. Otherwise, they’re like peanuts. You can’t stop with just one. The Bearded Collie is a medium-sized dog with long, shaggy hair. His body is longer than tall, starting with a kissy tongue and ending with a constantly wagging tail. A bright, enquiring expression is a distinctive feature of the breed. As an adult, Beardies may be black (from black to slate), blue (from steel blue to silver), brown (from dark or milk chocolate to gingery red), or fawn (cinnamon to champagne), usually with white markings to a greater or lesser degree. The life expectancy ranges from 12-14 years on an average. It is not unusual, however, for a Beardie to extend that lifespan. The height of the males is 53-56 cm while that of females is 51-53 cm. The Bearded Collie, affectionately called the Beardie, was developed in Scotland as a herding dog. He was developed as an independent worker, able to make decisions concerning the welfare and safety of their charges without depending on the shepherd who might be miles away. Flocks in Scotland intermingled freely, yet one Beardie never brought home a wrong sheep during his many years of work. The Beardie is still used as a shepherd’s helpmate in Scotland, and now in the US. Beardies are usually active, outgoing, bouncy, affectionate creatures. Within the normal range of temperament, they range from low-key, sweet and laid back to rowdy and bold. The breed interacts well with other animals, particularly if raised with them. They are people-oriented dogs and need to be with their family. If left alone for long period, they are liable to become frustrated and provide their own entertainment — not always one that makes the owner happy. Beardies are vigorous, bouncy dogs, and like to jump up to look you in the eyes or kiss your nose. This fits in well with many families. Because they love people, Beardies make good therapy dogs, comforting, entertaining and snuggling up to patients and residents. Beardies were bred to be independent thinkers. Sometimes they’ll decide what THEY want is better than what you want. For instance, staying in the back yard is more interesting than coming inside. Or playing in a mud puddle is more fun than staying on dry ground. The trick in training them is to convince them it’s something THEY want to do. And that takes an owner that’s smarter than they are — not always easy! Although they are neither yappy nor continuous barkers, certain things will set off their “alarm” system. They’re great doorbells, announcing all visitors with joy. They bark when excited: when you first rise in the morning, when family returns home or while playing. Like any dog, they may bark when bored. As puppies, they’re much like two-year-old children. They try out their independence, test their “parents,” and are so cute they’re difficult to correct. This is the time good parents must force down the chuckle, give firm, but gentle discipline and then go in the other room to laugh ‘til they cry. All dogs need grooming, training, exercise, nutritious food, access to water and shelter, veterinary care and LOVE. If you plan to skip on any of these, please don’t get a Beardie. In fact, please don’t get a dog! Grooming needs: Some dogs need to have their nails trimmed weekly; others do fine with just once a month clips. Beardies are long-coated dogs, and to keep their charming, winsome appearance, need regular grooming. Groomed properly, they shed minimally. Most of the dead hair will be removed by the comb and brush. The worst shed is when they lose their puppy coat, usually between nine and eighteen months. This lasts for approximately two to three months. During this period, they often lose their cuddly appearance and look scraggly and ragged, losing hair from the top to the bottom, or from the front to the rear. Start early to introduce your Beardie to his lifetime hair care. Baby Beardies can be groomed in one minute. The idea is to acclimate the pup to be still for longer periods of time until they can spend an hour quietly accepting brushing and combing. Most owners do a thorough grooming at least once a week. Lay the Beardie on his side and mist with water or anti-tangle spray. Brush the hair up with a bristle or pin brush. Then brush the hair back down a few inches at a time. Any mats that develop can be worked out with anti-tangle spray and your fingers or a mat rake. A comb should go easily through the hair when finished. Ask the breeder for a demonstration on an adult. When mature, Beardies usually require about one-half to one hour for grooming. Exercise needs: Beardies, like their pet parents, stay physically fit with exercise. This can be accomplished by playing ball, taking brisk walks, free run in a fenced area (with interaction, not alone) or a training session. They also love to jog, swim, wrestle, do tricks, join in football games, play catch or Frisbee. Health needs: Once the puppy vaccinations are completed, schedule an annual examination with the veterinarian. Be attuned to your Beardie’s body and behavior to note anything unusual that calls for medical treatment. Some Beardies have reactions to monthly heartworm preventative. Because of this, many breeders advise giving a daily pill. Discuss this with your veterinarian. Overall, Beardies are a sturdy breed who enjoys good health but problems like allergies, hip dysplasia, hypothyroidism, auto-immune disease and some eye problems, do occur. A beautiful and joyful breed!There’s nothing better than watching a Beardie at work, whether it be at a dog show, in agility, at a herding trial or just a romp in the park. It is a truly beautiful sight to see a Beardie running in full flight or standing in the wind. Those big eyes can really mesmerize people and always manage to get them a treat or cuddle on the couch.Their ability to make you laugh is one of my favourite things about the breed. They have a good sense of humour and love to play the clown. It’s very difficult to discipline a Beardie when he is proudly showing you his latest hole in the lawn or chewed slipper. I love their beautiful flowing hair and big soft eyes. If you have a home straight out of a lifestyle magazine and would prefer not to have the occasional splash of mud on a wall or footprint on the couch, then do not get a Bearded Collie. If however you don’t mind going to work with footprints on your pants and a few stray hairs on your jacket, then by all means consider the Bearded Collie as possible breed for you. You won’t be disappointed. http://www.dogsandpupsmagazine.com/wp-content/uploads/2011/01/breed021.jpg 134 250 Dogs and pups Magazine http://www.dogsandpupsmagazine.com/wp-content/uploads/2017/05/1254nal.jpg Dogs and pups Magazine2011-01-22 05:13:252014-02-07 17:40:33Bearded Collies: fun-loving beautiful chaps!